Be gentle with your tresses. Switch out your brushes and opt for a wide tooth comb for wet hair and a natural boar bristle brush for dry hair. It will keep your hair from becoming damaged. Try wearing your hair style more natural and avoid using a hair dryer and hot styling tools at least a few times a week. If you do use these tools, invest in a heat protectant to put on before you use heat on your hair. Aim to wash your hair every other day unless it is extremely oily. If you wash your hair every day and you don’t need to, you will just strip your hair of its natural oils and cause it to look dull. Use a dry shampoo in between washes to avoid a greasy look. Get rid of buildup. 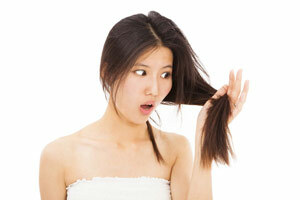 If your hair is starting to look dull, product buildup may be the cause. If you use products like gel or mousse regularly, they can leave residue behind that even regular washing can’t get rid of. Invest in a clarifying shampoo to use each week to get rid of any lingering buildup. Keep it hydrated properly. If your hair is dry and/or damaged, it can appear dull. If you want to regain shine, you have to moisturized properly. Try using a hot oil treatment or deep conditioning mask to regain moisture. If your hair is very dry, damaged or dull, see a professional for a more intensive moisturizing treatment. Don’t forget to seal your cuticle. You can seal your cuticle by rinsing your hair with cold water after you’ve used shampoo and conditioner. The cool water will help close the cuticle and enhance shine. If you can’t stand cold showers, try using a shine serum after the shower instead. Do you struggle with dry or dull hair? Will you try any of these tips? Let us know!